The other day, I met a chair. It is solid walnut, and exceedingly handsome, with four sturdy legs and a softly-curved back that cradles the body and encourages the spine to recline. It is worn in places, with dings and nicks from days upon years spent in service. It is a chair that should belong to a studious sort, one predisposed to a woolen wardrobe, layers upon layers of gray and black. The sort of owner that bears the weight of a long scarf wound endlessly about the neck. One that would ponder in this chair. Consider. Discuss obscure literature and drink very strong coffee. By candlelight, most likely, or at most an antiquated fixture that would offer the dimmest circle of golden light. It is a chair that encourages me to change my name, to cast off the trappings of the world, to instead choose to "live in a garret and eat black bread". It would be quite theatrical. And I would be quite comfortable. That is, as long as you understand that by garret I mean our den, and by black bread I mean bittersweet chocolate scones. This chair inspires scones. Demands them, even. Slightly austere in their sweetness, and comparitively meager in their fat, these scones revel in their dusky depth. The tenderness of their crumb is mitigated by the edge of cocoa and shot through with bitter chocolate. You can call me Nina if you'd like. Think of these as the biscotti of the scone world; slightly sandy textured and subtle in their sweetness, and pair well with coffee and tea. In the bowl of a stand mixer with the paddle attachment, combine the flour, cocoa powder, sugar, baking powder and salt. On the machine's lowest setting, cut in the chilled butter until the mixture resembles course meal. The butter should be in small pieces approximately the size of peas. Alternatively, sift together the dry ingredients in a medium bowl, then cut in the chilled butter with two knives or a pastry cutter. As before, the blend should be rough, with uneven pieces of butter still visible. Lightly whisk together the whole egg, cream and vanilla. With the machine running still on low (or stir), pour the liquids slowly into the flour and butter mixture, stirring until just combined. Small bits of butter should still be visible, but almost all the flour should be incorporated. With the mixer still on low, stir in the chocolate. If proceeding by hand, use a wooden spoon or silicone spatula to fold and turn the flour mixture to incorporate the liquids, then stir in the chocolate. Do not overmix. Turn the dough out onto a lightly floured surface. Working quickly, gently knead the dough, folding and pressing gently until fairly smooth. Divide the dough into three, and shape each ball of dough into a 4" round about 3/4"-1" thick. Cut each round into four wedges, and place on the prepared baking sheet. Once finished, brush each scone with the egg white and sprinkle with extra granulated sugar. Bake in preheated oven for about 15 minutes, or until the tops are matte and the cut sides look flaky and dry. When fully cooked, scones should feel light for their size and sound almost hollow when tapped underneath. Cool on a wire rack for at least 5 minutes. Best served warm. • As mentioned, these scones are only modestly sweet. For a more indulgent treat, substitute the bittersweet chocolate for a semisweet or even a milk chocolate. I encourage cutting up bar chocolate rather than morsels as bar chocolate is free from the stabilizers in chips that help them keep their shape. The uneven shards of chocolate will slightly melt into the dough, turning into little puddles of oozing darkness. • For added richness, substitute 1/2 cup heavy cream for the 18% and use 2 large eggs instead of 1. In this variation you may need more flour for the dough to come together. Add it sparingly, a bit of stickiness to the dough is good. I love a good backyard. Don't get me wrong, a front yard is a wonderful thing. A front yard, and specifically a good front porch, is the place to watch the world go by. It is see and be seen territory, the perfect vantage point to watch the life of your neighbourhood play out in front of you. In childhood, a front yard is where you meet your friends. Its the soccer field and the skate park. And, in my personal experience, the backdrop for Barbie-related-dramas. In University the front yard was home to the living room couch, yanked from its indoor confines and released to the great outdoors. It was the spot to lounge away the first sunny days of the season, preferably with beverage in hand. After that, my front yard was first a fire escape and then a modest balcony, where we sat drinking "classy" wines and pretended to be worldly. Now, I survey the front yards on our quiet street, with chalk drawings that tattoo the pavement, the toys and bikes and soccer balls left out on the lawns. Gardening tools are nestled by the front door. A watering can sits, stainless steel and gleaming, jewel-bright. Artifacts of the day's adventures and plans for the days ahead. From our front step I nod to the neighbours, and Benjamin's own technicolour hieroglyphs decorate the pavement. But a backyard is a whole other world. Even though it is outside, it feels more intimate, more like an extension of your home. The front yard is about show and the backyard is about substance. It is where we really live out of doors, and where others must be invited to gain entry. This is only our second summer with our backyard, and were becoming fast friends. Last summer we were occupied with the business of having a baby, so this feels like our first opportunity to truly understand its rhythms; the way the light falls throughout the day, the cycle of plants we've inherited, and the time to revisit the haphazardly-laid plans we made a year ago. It's got good bones, our backyard does, but is in need of a bit of a facelift. If our yard were in a movie, it would be cast as the "plain" girl who has a messy ponytail and always keeps her head down, the one that is suddenly altogether gorgeous once someone takes the time to look. Its there. I am sure of it. The possibility of specialness, the promise of nooks and crannies for little boys to find magic, a home for a little vegetable patch, and most surely a hammock. We're almost there, our heads full of plans and with days circled on the calendar devoted to the endeavour. All of that will come in time, and right now I am more than happy with this space outside we have all to ourselves. The lilac is in bloom, and the leaves that form our summertime roof are slowly beginning to unfurl. There is space to run and crawl and cook and dig and plant. And there is my spot, just a beeline out the back door, four strides at most, at the top of the two stairs that lead down from the deck. Sit down with a snack, and suddenly its a picnic. Stretch out, and your toes can reach the grass. 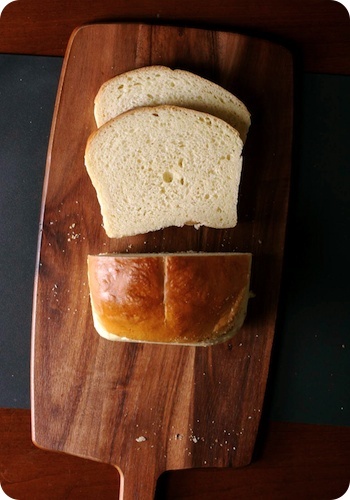 Another thing that is almost there is my attempts at making the perfect sandwich bread at home. I have been experimenting away, fiddling with yeast and rising times, with quantities of butter and sugar. Sorry about the wait, but one family can only eat so much bread at a time, and we're not a one bread sort of household. I have realized that we like our bread plain enough not to overshadow what's put on it, but with enough personality that it is not merely a mode of transport for other ingredients. Right now, this variation on Julia Child's recipe is our usual as far as sandwich-style goes. The longer rise gives more substantial texture, and the reduced amount of yeast is preferable to our tastes. Previous columns regarding sandwich bread are here and here. Use only 1 teaspoon of active dry yeast, allowing the dough to rise for about 2-2 1/2 hours for first rise, or until doubled in size. The second rise time will also be longer, about 90 minutes to 2 hours. Use 2 teaspoons of sugar instead of 1 tablespoon. Use 6 tablespoons of butter instead of 4 tablespoons. I usually dust the tops of the loaves with a bit of flour before baking, and sometimes melt 1 tablespoon of butter to brush on the loaves after the flour. 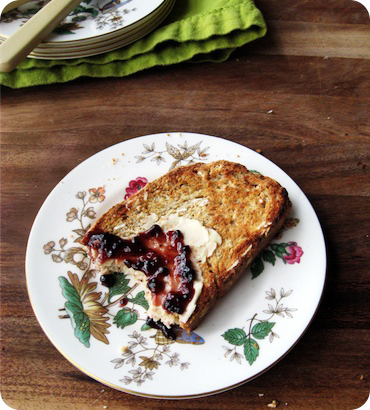 Lightly toasted; an adapted Irish soda bread slathered with butter and black raspberry preserves, served on my Grandmother's china. When I married my husband, I adopted his surname. Lucky for me, attached to that marvelous man was a name that suited my own and came with an added bonus - an apostrophe as its crown. And so, on our wedding day, my Indian self became an Irish girl. At birth each of our sons were claimed by their history, given names which carry meaning in our respective families. As the boys grow, I am time and again amazed by the echoes of their heritage as they become evident. William's smile is the replica of his father's at the same age. Benjamin's eyes carry my expressions. Family members tell stories of relatives we have never known, and how they are mirrored now in our children. I am struck by the wonder of it, the way that traits find their way through bloodlines, inextricably weaving generations together in repeating pattern. It is an unending chorus, sung in round, sung back. Our sense of identity is in constant evolution; carrying on and adding on, as we move forward in lives and relationships. Despite this change, we often remember back as we move ahead - gesture a nod of acknowledgement to the clans, countries and cultures from which we came. Although I cannot pretend to be an expert Indian cook, I do attempt to speak that language of spice in our kitchen. My chicken curry might not exactly be my father's, but it is the one my children will know as "theirs". I have made a refrain of my commitment to maintaining that vocabulary of food, so that it will remain familiar. With the day for St. Patrick approaching next week, my thoughts took a Gaelic turn. Irish might make up only a fraction of our family, but its brand upon us is indisputable - therefore it seemed proper to herald the feast of the patron saint of Ireland. Ever-present on the Irish table, hearty, satisfying soda bread made its way to our plates, with its unassuming stature and nubbled crumb. Although its rough-hewn crust seems substantial, its cheeks are tender. Soda bread is heavier textured than a scone, and with a flavour more subtly-complex than the all-out buttery-ness of a biscuit. The romantic side of me wants to say that the reason my sons and husband enjoyed this bread so much was because of some genetic predisposition - a subconscious recognition of an ancient root in their geneology. That may be the case, or it might have just been some good bread. Either way, the intent was there; a meal to celebrate not one day, but all those that had passed before. Traditional Irish soda bread only contains flour, buttermilk, baking soda and salt. This version uses a mix of flours, along with oats for texture, and an egg for richness. Since I more often than not have yogurt in the fridge, I have used it as my liquid. A quick bake in high heat allows you to have bread on the table, from start to finish, in about an hour. Preheat oven to 425°F (220°C). Line a standard baking sheet with parchment paper and set aside. In a large bowl, whisk together the flours, oats, salt, sugar, baking powder and baking soda. In a small bowl, whisk together the yogurt and egg. Set aside. Using a pastry cutter, two knives or your fingers, cut the butter into the flour cutting and work the butter until the mixture resembles coarse meal. Stir in the yogurt, mixing until you have a rough dough. Use your hands to turn and lightly knead the bread in the bowl, incorporating all the dry ingredients. Working quickly, turn the dough onto a lightly-floured work surface and knead gently for about 30 seconds; the dough should be soft and elastic. Form the dough into a boule, about 8-inches across with a gentle dome and slightly-flattened top. Dust the surface of the bread with a sprinkling of flour, then use a sharp knife to slash a shallow cross from edge to edge of the loaf. Transfer bread to prepared baking sheet. Bake for 35-45 minutes, or until the bread is golden brown and sounds hollow when tapped on the bottom. If the crust gets too dark during baking, tent loosely with foil. Cool on a rack for at least 10 minutes, then enjoy. • The dough make take a few turns in the bowl to fully come together. If only absolutely necessary, add a bit more yogurt, a teaspoon at a time, to incorporate all the dry ingredients. Work the dough as gently as possible. 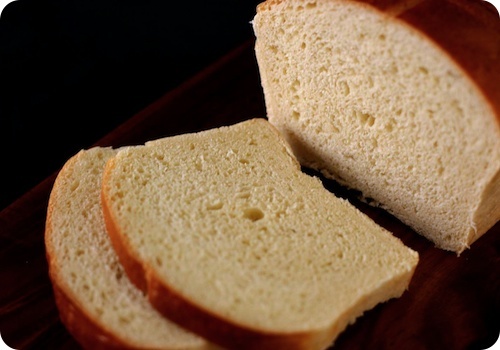 Quick to make, pretty tasty to boot - but not the loaf for me; Ina Garten's Honey White Bread. What can I say that has not already been said in the adoration of bread? 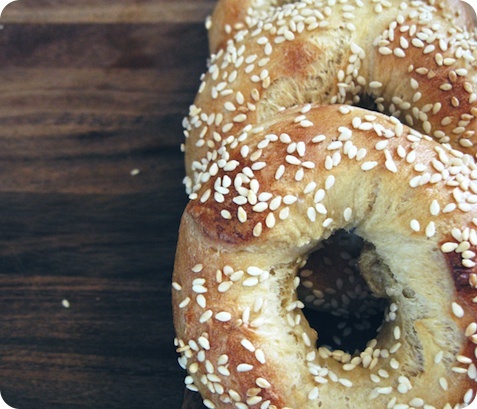 To many, good bread is the cornerstone of their idea of good food. It is a basic staple of life, one that manages to not only nourish the body, but also inspires passion in the soul. The process, the crust, the crumb, the aroma, the texture, the colour, the taste ... each and every aspect of bread, its ingredients, its making, and its consumption, has been examined and often exalted. 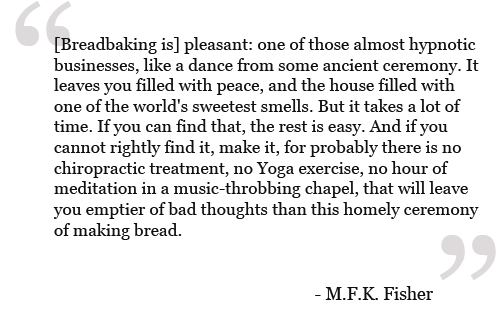 I will not presume to think that I could add any more eloquence to its chorused praise; instead, I can only speak of how bread and its baking has become a part of the rhythm of our days. As we are a family of bread lovers, I bake bread. To be specific, I bake bread often. Every few days, I am dusted pale with flour as I set about putting up some dough. I have made naan, I have made yeasted crescents laminated with butter, I have made soft and open-crumbled breads meant for sopping up soups and stews. I have made hearty, nubbly-textured seeded rolls. I have made foccaccia, both savoury and sweet. I have explored the personalities of rye, whole wheat and flax, of oat bran and wheat germ. But most often, I make this. That is what my husband and I consider our bread, my variation on Jim Lahey's No Knead Bread. Yes, that bread, the one that seemed to set the entire food community a-baking in late 2006. Our version has bit of extra flour to suit the size of our cocotte, and a bit of extra salt to best suit our tastes. We have tried different flours to perfect our brand and blend. I make it without a specific measurement of water, as through our long and loving relationship I have learned the quirks of the dough's texture well enough to determine by eye how much is needed. It is not very difficult to make, but it is very rewarding. Oh, and despite its name, I do knead it, just a bit, so that it springs back ever-so-slightly before its last rise. Every time I make it I still have a slight swell of pride at the thought that something so satisfying could come from my oven. It is a staple, a without-thought routine of our day-to-day. This bread has often made command performances at extended family events, in its original form and multiple grain variations. Which brings me to my dilemma. While I am more than happy to munch on a (generous) slice of this crusty boule, there does come an occasion where only sandwich-style bread will do. Pleasantly squidgy, the grocery-store classic is the stuff of many a childhood peanut butter and jelly lunch, of open-faced, gravy-soused hot turkey sandwiches made with Thanksgiving's leftovers, and the basis of a perfect grilled cheese. (Nigella Lawson specifically encourages its use for her Mozzarella in Carrozza.) There is a familiar comfort to its blandness, a charm in its yielding texture. My trouble is, as much as this sort of bread is a standard in my memory, it is not one in my home. I just cannot seem to find a recipe that I adore. I like the Soft Sandwich Bread, American Style from Homebaking: The Artful Mix of Flour and Tradition Around the World (Random House, 2003) by Jeffrey Alford and Naomi Duguid. I have made it rather often, with our eldest son Benjamin taking delight in the loaves as they rise on a sunny windowsill. It a pre-fermented starter called a biga, which adds a deeper complexity to the final product. 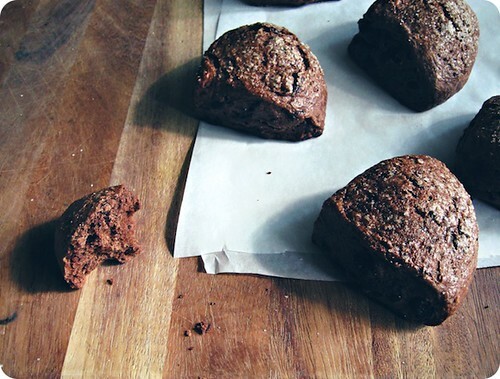 But, as delicious as this bread is, it did not stop me from trying my hand at other versions. My most recent attempt was Ina Garten's Honey White Bread, from Barefoot Contessa at Home (Random House, 2006). My affection for Garten's recipes is nothing new; and this one looked a treat. Garten's recipe left most of the work to a stand mixer, with minimal hands-on effort required. And although I do enjoy a bit of kneading, it seemed novel to allow the machine to do the heavy labour. After a whirl around the mixer, it took only a few turns for the dough turn silken under hand. Into the buttered bowl it went, rising up enthusiastically after an hours rest. I punched it down, formed two generous loaves and waited again. I was convinced that Garten's assurance of "foolproof good bread" would deliver me to sandwich nirvana. But alas, I was left unsatisfied. Now that is not to say that this is not a good bread. In fact, I am sure that many people would hazard to say that it is great. After baking, the loaves emerged bronzed and beautiful, with a proud, Dromedarian hump. 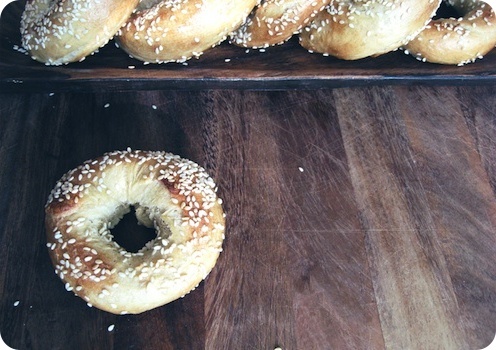 When sliced, they were soft, pleasantly dense, with an even-textured and tight crumb. Where I was disappointed was the taste. Maybe it is just me, but while I appreciate the relative brevity of its preparation (just under three hours from start to finish), the amount of leavener and honey used to achieve that speed were all-too-evident in its sweet, yeasty flavour. This, coupled with the richness of egg yolks and butter, resulted in a bread that would surely be perfect as a substitute for challah or brioche for pain perdu or summer pudding, but seemed distractingly-sweet when eaten alone. It just was not what I was looking for. And so, it was back to my boule for us and back to the recipe books for me. And although there is a half a loaf in our breadbox just now, I am still thinking of the perfect sandwich loaf. I am more than open to suggestion, and any guidance would be appreciated and welcomed. From the book Barefoot Contessa at Home by Ina Garten. The recipe can be found online.